From $3900 / person | Comprehensive package including accommodation for all nights, in-country transport by private bus, train, or flight, lecture and instruction materials from our expert guides, all activities as listed on the itinerary, and 3 meals per day. *International Airfare and Visas not included. This Acanela Expedition © is the perfect fusion between luxury & adventure, depending on your choice of accommodation. Embark on this small group exploration and have hands-on encounters with the wildlife and cultures of Africa, while experiencing all the historical and culinary highlights along the way. The Serengeti is one of the world's most sought after safari lands; it’s home to over 70 kinds of large mammals and 500 species of birds. The Great Migration, involving upwards of 1.2 million wildebeests, is one of the Seven Natural Wonders of Africa. As a UNESCO World Heritage Site, the Serengeti boasts numerous lakes and rivers, Great Rift Valley, and Ngorongoro Crater—the world's largest inactive caldera. The park is also within easy reach of Mount Kilimanjaro, Zanzibar Islands, and Kenya’s Maasai Mara. Welcome to Tanzania! You’ll be greeted by your private guide at Kilimanjaro National Airport—the gateway to the incomparable Serengeti National Park, known for its Northern Circuit safari. Once you arrive, you’ll enjoy some downtime before dining on a traditional welcome dinner, bursting with the flavors of authentic East African cuisine. We’ll spend the night in Arusha and prepare to start our safari the next day. A private driver and expert guide will meet us bright and early at the accommodation. From here, we’ll embark on the start of our safari adventure through the Northern Circuit of the Serengeti. Our opening adventure will be in Tarangire National Park, where we’ll head out on a game drive, spotting a diverse range of animals. We’ll have our first taste of safari life and encounter lions, elephants, giraffes, and more—this park is known for its large elephant population and infamous tree-climbing lions. We’ll spend the next four nights in either a tented camp or safari lodge, located in the central part of Serengeti National Park. After an exciting day, relax around the campfire, listening to the sounds of the wild and falling asleep under countless stars. Today our drive will take us deep into Great Rift Valley and the heart of the Serengeti. We’ll visit Lake Manyara National Park, home to a rich variety of wildlife roaming the African Savanna as far as the eye can see. This park is known for its large flamingo flocks, and make sure you don’t miss the opportunity to capture a photo of hundreds of rosy pink flamingos set against a striking blue backdrop. During the day, we’ll pass through Mto wa Mbu village and meet the local Maasai people—the most famous East African tribe, originally inhabiting the East African Rift Valley. The Maasai people are nomadic herders, known for their fierce warfare and traditional adumu, or “jumping dance.” We’ll learn about their culture, traditions, and way of life before heading out for a delicious dinner cooked by talented local chefs. Today we’ll continue our exploration of the heart of the Serengeti, passing rural villages and observing the “Big Five”: the lion, leopard, rhinoceros, elephant, and buffalo. After a day full of amazing encounters, we'll enjoy a delicious dinner as we relax around the campfire, surrounded by the sounds of the night wildlife. Today we’ll will set out again to see the wildlife and might get a chance to experience the renowned Great Migration, where masses of wildebeest and other game animals migrate across the rivers and plains of the Serengeti (seasonal). This attracts predators in the region, so spectators are guaranteed to see an abundant variety of animals. Later we'll set out on a sunset game drive while the animals are out and about after the heat of the day has passed. We'll continue onwards to the Ngorongoro Crater for dinner & overnight. The final day of our Serengeti adventure will take us deep into the Ngorongoro Crater, which holds some of the world's most famous safari land. The crater is one of the best locations in Africa to spot various animals—marvel at majestic flamingos, playful elephants, and grazing giraffes. There’s also always the possibility of spotting lions preying on animals lounging at the water’s edge. Traveling a short distance from Arusha, we’ll visit a little town called Moshi—the starting point of the trek up Mount Kilimanjaro, one of the world's Seven Summits. We’ll take in the otherworldliness of this majestic mountain, stroll through the surrounding villages, and soak in the secluded, sparkling hot springs, a favorite location of weary hikers after conquering the mountain. Spend the morning relaxing in Arusha and visiting some of Tanzania's best artisan markets. In the afternoon, it’s time to catch our flights back home. Get ready to tell your friends and family all about your unforgettable experience exploring the Serengeti! Join us on a Ugandan gorilla tour—one of Africa’s can’t-miss activities! We’ll hop on a quick flight to Uganda, where we’ll head deep into the lush jungle on a journey to see the world’s last remaining wild gorillas. Spend an extra week in Tanzania challenging yourself as you hike to the summit of Mount Kilimanjaro. This mountain holds Africa’s highest peak and is one of the Seven Summits. The journey will bring out an inner-strength you didn’t know you have, and is guaranteed to be one of the most fulfilling experiences of your life. The food while on safari is prepared by your private camp chef, and can range from pasta and vegetables to simple meat dishes served with salad, beans, and a side of rice. All of the food is prepared to Western Standards and is safe & delicious to eat! For those who enjoy the culinary (cooking experience) there are frequent opportunities to join the chef as he prepares food in the camp. 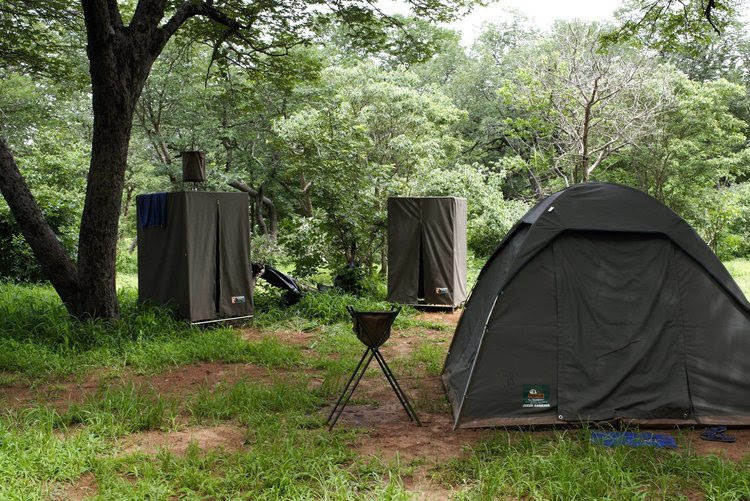 Is it safe to camp while on safari? The wlidlife in Tanzania is abundant year-round, but there are better times to visit than others. Summer (May-August) is great for wildlife viewing, and the most common time to travel - so expect more tourists. Fall (September-October) is the dry season, which means that the animals cluster around the watering holes for easily spotting opportunities (and there are less tourists). The Winter (November-December) is the wet season when the famous Wildebeest Migration occurs, before clearing up for clear weather in January and February when the Wildebeest Calving takes place. The Spring (March-April)is the wettest season of the year where you will experience the most rainfall, but many people still choose to travel during this period (as prices are lower and tourists are fewer).